In total 23 members from Arsenal’s first team squad and the reserves featured for their respective countries on international duty. Thankfully Arsenal captain Robin van Persie only played the first-half of the Netherland’s 3-2 win over England, although in saying this was not particularly influential in the first-half anyway. Below are the outstanding performers from the international fixtures. Joel Campbell – Costa Rica – The Arsenal loanee, currently plying his trade at Lorient, was the sole goalscorer in Gary Speed’s memorial match and sealed victory in the opening exchanges of the match. In the seventh minute Bryan Ruiz received the ball in front of the box and put in a great ball between two Welsh defenders. Campbell, who made an excellent run in behind the defence, made no mistake in slotting the ball into the bottom right-hand corner of the net. Full match highlights, including Campbell’s goal, can be seen below. Alex Oxlade-Chamberlain – England Under-21’s – The young up-and-coming Englishman converted a penalty that he himself earned in England’s 4-0 demolition of Belgium’s Under-21 side. The penalty was the last act of the game and puts the England Under-21’s in a great position in terms of qualifying for Euro in 2013. 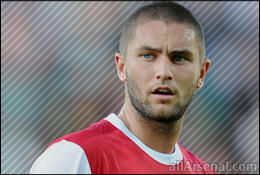 Henri Lansbury – England Under-21’s – The Young Englishman also featured in England’s comfortable victory against Belgium securing a brace that he opened with a spectacular first goal. Receiving the ball on the left-hand side it is unclear whether Lansbury was shaping to cross or shoot, but ultimately the long-range stunner gave the Belgium keeper no chance. His second was much more routine after good work from Saha lead to a cut-back with Lansbury waiting to slot the ball home. Full match highlights, including Lansbury’s brace and Chamberlain’s penalty, can be seen below. Andrey Arshavin – Russia – The little Russian, who recently completed a loan-move to Zenit St. Petersburg, featured in both of Russia’s goals in their comfortable 2-0 win over Denmark. For the first Arshavin picked out fellow team-mate Shirokov just in front of the box. Shirokov made no mistake with a clinical strike into the bottom-left hand corner. The second was much more fortunate. Arshavin again receiving the ball in front of the box turned his defender well and thumped a shot straight towards the Denmark goalkeeper who clearly misread the flight of the ball and dived out of the way. Full match highlights can be seen below.